The question came to Lisa Bluder with the appropriate stipulation. Other than Jessica Shepard, is there a better freshman in the Big Ten right now than Megan Gustafson? The Iowa coach has spoken highly of Michigan freshman center Hallie Thome, and there is Penn State's Teniya Page, who has put together a strong season. However, Bluder has her own set of freshmen that continue to put up impressive numbers. Davis and Gustafson have both put themselves in the mix to be named to the Big Ten all-freshman team with strong play over the conference season. Gustafson has posted double-doubles in five of her last six games and is averaging 9.6 points and 7.6 rebounds per game in Big Ten play. Davis is averaging 9.1 points and 3.9 assists per game during conference play and has drawn the defensive assignment of defending some of the nations best scorers. The reference to Shepard is noteworthy. Shepard has set a conference record by being named Big Ten freshman of the week 10 times this season and is the first freshman in Nebraska history to record 500 points in a season. TOO MUCH BANHAM: Iowa saw firsthand on Monday exactly how scorching hot Minnesota senior Rachel Banham has been over the past several weeks. Banham scored 35 points on Monday in Minnesota’s 78-76 win over Iowa, including the game-winning 3-pointer as time expired. It was the third consecutive 30-point performance for Banham, who added nine rebounds and eight assists in the win. Banham is now 79 points away from tying the Big Ten career scoring record of 2,919 held by Kelly Mazzante of Penn State. REDEMPTION TIME: Three of Iowa’s final four conference games come against teams that have already beat the Hawkeyes this season. Iowa gets a chance to even the season series with Purdue, Indiana and Penn State in the next eight days. Along with playing for a postseason bid that redemption is providing some added late-season incentive. POSTSEASON PLANS: Iowa plans to be playing in the NCAA Tournament for the ninth consecutive season. If those NCAA plans don’t come to fruition Iowa still expects to play basketball in March. 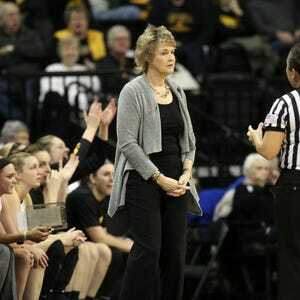 Bluder said Tuesday that, if offered, Iowa would accept a bid to the WNIT. “We will be playing in the postseason, we need to get experience, so absolutely,” Bluder said. “We aren’t too proud to turn down the WNIT, but we are still setting our sights on the NCAA."